Image caption Joel Tenenbaum has been fighting the case since 2003. Joel Tenenbaum must pay $675,000 (£426,000) in damages awarded to the major US music labels after his request for a retrial was turned down. Mr Tenenbaum, 25, was found guilty of illegally downloading and distributing 31 songs in 2007. 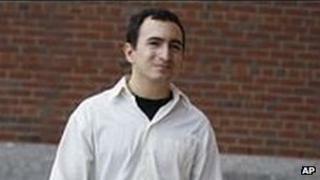 A judge in Massachusetts ruled that the damages, set by a jury in 2009, had been fair. Mr Tenenbaum was 16 years old when a letter was sent to his parents' home accusing him of illegal file-sharing. He was asked to pay $5,250 (£3,319) for downloading seven songs. He claims he offered $500 (£316) which was all he could afford at the time, and it was declined. In 2007 the case went to court for the first time. On his website Joel Tenenbaum says that he counter-claimed "asserting abuse of federal power". He refused to settle and a new trial was set for 2009. The result of that trial was the awarding of damages to the major US record labels. In the US a jury can set a fine of up to $150,000 for every occasion of wilful copyright infringement, meaning that Mr Tenenbaum's fine is below the maximum he could have received for the 31 songs he was found guilty of illegally sharing. The Recording Industry Association of America (RIAA) said it was "pleased" with the decision made by District Court Judge Rya Zobel in Massachusetts, reports Cnet. In court Mr Tenenbaum had admitted to file-sharing around 800 songs. "I used the computer. I uploaded, I downloaded music," he said. In the past he has refused to take donations from supporters keen to help with the fine. "This lawsuit was against me. This is my verdict," he wrote on his blog.